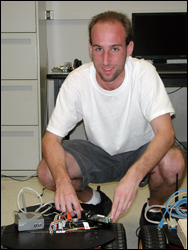 ISR undergrad student Travis Young and Professor P.S. Krishnaprasad (ECE/ISR) recently were honored at a ceremony for the University of Maryland's Philip Merrill Presidential Scholars Program. Young was selected as one of only 25 undergraduates campuswide to be named to the 2006-2007 Merrill Presidential Scholars list. The program honors the university's most successful seniors, along with faculty and teachers from their K-12 days who mentored them. The ceremony brings teachers and faculty together to form stronger collaboration between the university and K-12 schools. Young has been active in the robotics research carried out in ISR's Intelligent Servosystems Laboratory. He said Professor Krishnaprasad was an "invaluable advisor" who was "helpful and willing to listen." He also credited his professor for giving him independence and helping him gain valuable experience in the laboratory. He also expressed appreciation for his high school teacher mentor, Tom Sankey, of Mount Hebron High School in Howard County, Md.